KGA Geotechnical provides specialist geotechnical engineering consultancy services for projects ranging from residential houses up to large scale commercial and infrastructural developments. Input is provided to all stages of development, from initial feasibility through subsurface investigation to design, construction and certification. We operate from two office locations, Auckland and Christchurch, and provide world class and state-of-the-art geotechnical solutions for projects undertaken both in New Zealand and through the Pacific Islands. KGA´s philosophy is to work with their clients to achieve an optimum solution to any building project that is feasible, technically sound and cost-effective. In 2001 Park Flooring was created and has since specialised in the importing, supplying and providing of quality flooring solutions. Starting out as a 50 square metre office with only 12 employees, we are now proud to say that we are one of the industry leaders for quality flooring in New Zealand. Offering a wide range of products and a professional installation service, it’s not hard to see why as we really do have something for everyone. Choosing only quality European suppliers and products in accord with our values, Parks Flooring shows its commitment to the environment and our main supplier, KronoSwiss Floor (the original Swiss flooring specialist), are a true testament to this. Today, Parks Flooring is proud to offer high quality products that have been installed in hundreds of houses all over the Auckland region. Our Compressed Bamboo Floor in particular is a big seller due to its sustainable benefits, physical characteristics and aesthetic appeal – some of the major reasons for the ever increasing popularity of the material. Eco-conscious elegance is what we strive to provide for our customers and creating something that suits their needs and lifestyle has become our number one priority. We look forward to hearing from you as we are sure your experience with us will be a pleasant one! With over a decade of experience, Elite North Harbour has been one of the foremost in delivering top of the line aluminum windows and doors in Auckland. Custom made to every customer’s lifestyle, design, and budget, our experienced team prides itself on the highest quality from manufacturing to installation. New Zealand No.1 Chinese Social Media and Marketing Company. 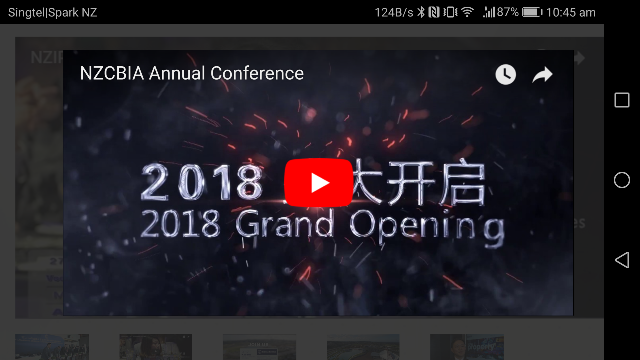 Check out the official launching video, learn more about 2018 NZCBIA Annual Conference and Expo. We are an exhibition and show specialist that provide online platforms for exhibitors to promote their worldwide products and technologies.